Our life is filled with them. Sometimes you are at the center of a moment, like when you score the winning shot in the basketball game and your team gathers around congratulating you. Or at times a moment is just for you and another person, like the first glance shared between two young lovers. The moment when your eyes meet for the first time and your soul connects without even whispering a word aloud, but one is said between your hearts. Then there are more notable moments. Moments that change your life. Some for good, some for bad, some for forever. Good moments, like when you scream "YES!" or in my case "Of course!" in response to the man of your dreams on his knee in the pouring rain on top of the Space Needle, as he finally asks you to marry him. Bad moments, as we all know so well, when words of pain are pierced into your heart forever by the angel of death disguised as doctors. Moments that include the words "I'm sorry" and "There is no heartbeat." Both of these moments, good and bad, change your life forever. It's in these moments where we live. It's in these moments where we should do MORE living, because life is a collection of sometimes sweet & scrumptious moments, and sometimes sour and poisonous ones. 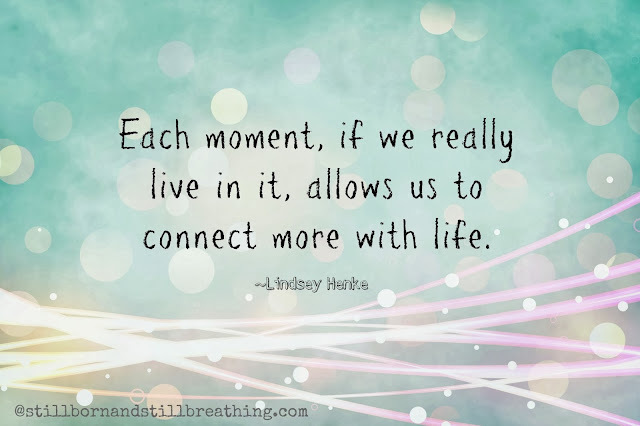 But each moment, if we really live in it, allows us to connect more with life. I want to share with you a moment from this past Sunday. A moment I was neither a part of, nor shared with another, where I was only a witness to beauty. 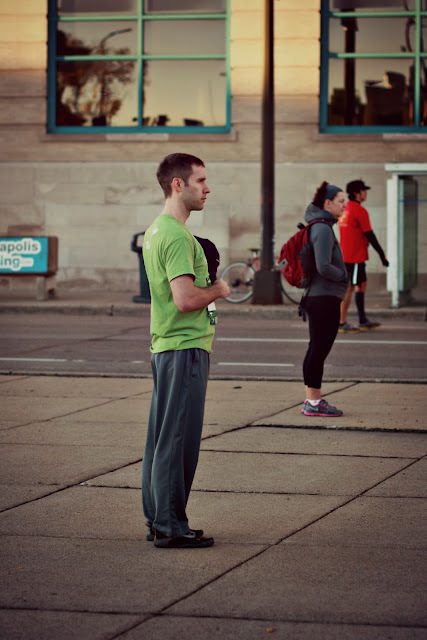 A moment that was strangely meant only for me, even though it involved a whole community of people. 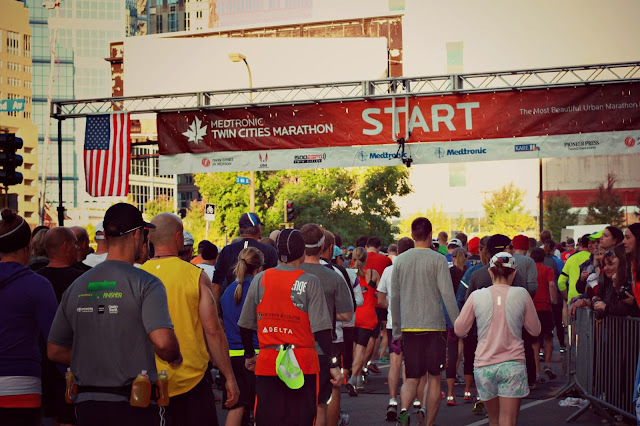 I had just kissed my beautiful husband goodbye as I was dropping him off at the starting line of his first marathon, The Twin Cities Marathon. As I began to walk away, over the PA system the national anthem started to play. 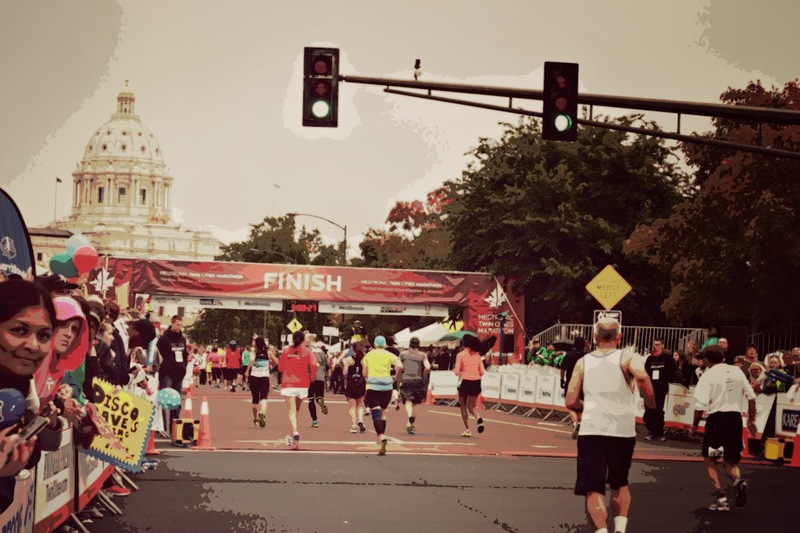 I had just turned my back to my husband as it began when I was compelled to glance back one more time to see where he was at, as I wasn't going to see him again for about five hours and hopefully at the finish line. When I turned around to search for him I thought he would have been further up in line, but to my surprise he was standing in the spot where I had left him, as still as statue, with his hat over his heart and his eyes facing the flag. People where buzzing around him, running towards the start line, saying goodbye and good luck to their loved ones, or stretching and jumping up and down to stay warm as runners do before a big race. But not my husband. My husband, my beautiful, honorable, humble, soldier of war, husband was standing there in silence, paying tribute to his country, his flag, and his freedom--all that he served for and believes in. I snapped this picture of him in that moment. I write this now with tears running down my face because I'm so proud and full of love for this man and all the respect he shows others and the world by simply holding his hat over his heart. I know it's a small thing, but even though I was in the process of leaving, I was just drawn to watching this moment with my husband at the center of it. It was if the moment was just for me. He did not know of my awe for him right then. Others could not see the love I held for him welling up inside of me. But, it was one of those moments that I could not pull away from and captured my soul. It was a moment that reminds me why I love this brilliant man. There were other moments that day, that moved me to tears. Like at the finish line when I witnessed a couple holding hands and waving them in the air as they accomplished their goal of completing the race together. Or when a man collapsed 10 yards in front of the finish line from what appeared to be exhaustion and an injury as he was limping before he fell on his hands and knees. 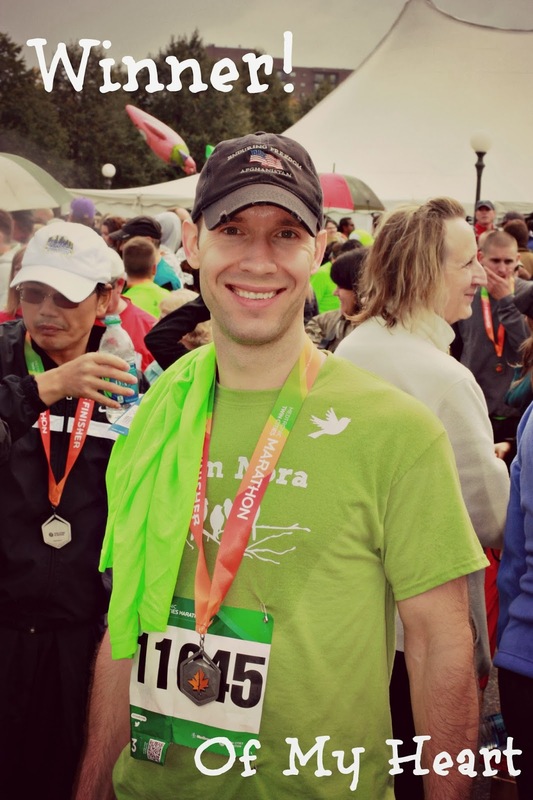 It was heartbreaking to watch, but if you waited just one more moment, if you could stay with the pain for only a moment, a moment of beauty appeared, as two runners who came in behind him stopped and both on either side of the injured and exhausted runner held him as he limped his way towards the finish. 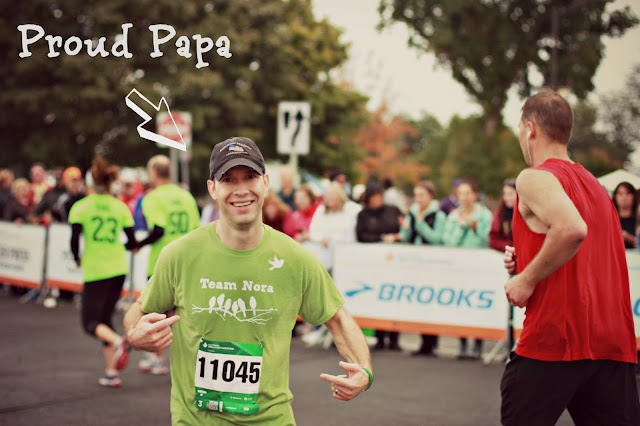 With the help of these two other runners, the man gained strength from what appeared to be their kindness and finished the race on his own two feet. It was touching. I sobbed from the sheer beauty of it all. It seems like moments hit me harder now that Nora has died. The good and the bad and all of the in between. It's as if I really didn't FEEL life and the precious gift of each moment until she existed. This is her gift to me. FEELING life and all it's complexity. This past Sunday, when Nick crossed the finish line in his "Team Nora" shirt and even his stories of his moments of people cheering him on saying "GO TEAM NORA" none of these moments compare to the moment when I saw my humble, honorable, husband hold a hat over his heart. It's a moment that was mine and mine alone. A moment for me to embrace and be entranced by the love I feel for such a special man and my love for him somehow spilled out of me and radiated into loving and FEELING all the precious moments of the community and life around me. Your articles are all of an immeasurable beauty and depth . I'll be in the autograph line when you release your first book. Awesome. I cannot tell you how inspiring your posts are. Absolutely beautiful. I agree with you. I am in the moment so much more now, and feel things deeper and appreciate the little things so much more than the former me ever did. Yes, so much is so much more precious now.